Posted August 5, 2015 by Jackie McMillan & filed under Breakfast, Cafe, Eat & Drink, Modern European. It’s only their tenth day but Majestic Harvest is already getting slammed by a mix of old school Petersham and those ever-present young renovators. Yet despite some hipster trappings – Edison bulbs, cold drip, food on boards, ‘cold pressed’ Daily Juice ($6.50) and dishes presented in frypans – the food is remarkably honest and free from (much) pretension. 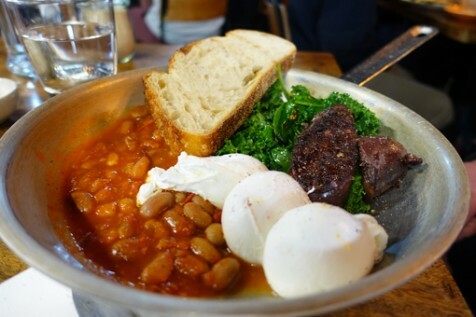 The aforementioned, slightly unwieldy frypan, dubbed The Majestic ($19), is loaded with well-handled kale, supple Serrano ham, a trio of poached eggs with rich golden yolks, baked beans and black pudding. Taleggio and basil have been softly folded through Scrambled Eggs ($12.50) offset by roasted Roma tomatoes. While the accompanying sourdough isn’t buttered, our waitress offers some before we have time to request it. For those who cringe at butter, a board bearing Bircher Muesli ($11) in a bowl topped with blueberries, walnuts and coconut, is made compelling by blackened apple compote. Allpress Coffee scrubs up well as a Latte ($3.50) despite the machine running flat chat. They sensibly moved takeaway coffees to their bakery machine, part of Majestic Gourmet Grocers, which fills out the bulk of the old seventies roller-skating rink. Taking the Mercato e Cucina model but making it Mediterranean rather than Italianate, this marketplace includes a deli, florist, green grocer and fish and chippy.